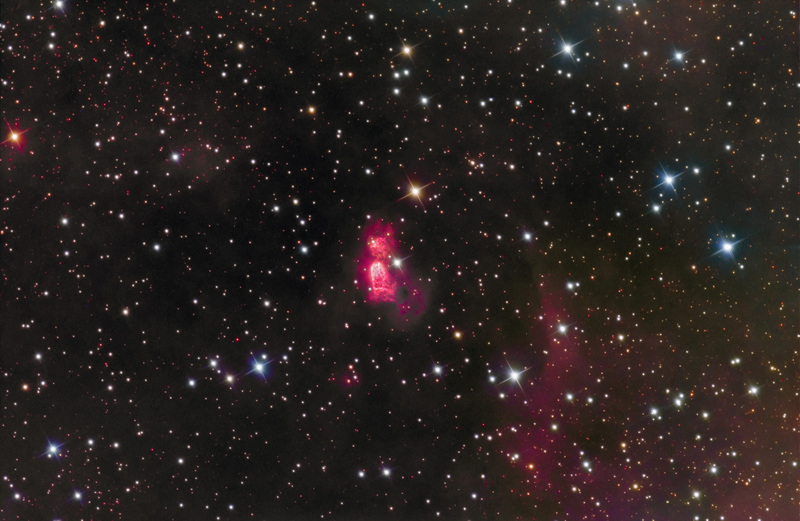 Sharpless 2-106 lies between Sadr and the Veil SNR in Cygnus. At first glance, it appears like a bipolar planetary nebula. That is what attracted my attention. However, it is not a PN. It is an emssion nebula. 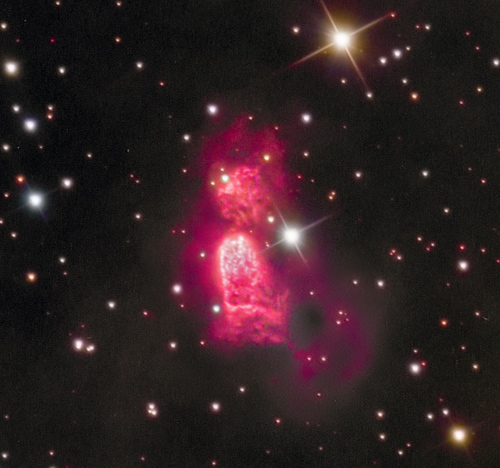 600 pc distant and quite small at 0.5 pc long (~2000 and 1.6 light-years, respectively), and is ionized by an O8 star, S106IR. More details can be found here based upon radio data. 2 hours of NIR-blocked Luminance and 70 min of each R,G,B, augmented with 90 min of H-a and 90 min of OIII using Astrodon filters. The upper circular object is deficient in OIII, most of which is concentrated in the bright portion of the lower object. There is considerable surrounding nebulosity, as expected in Cygnus near Sadr. The deep luminance show a large circular region centered around the object with less emssion than the surrounding areas. You can see a bit of this arc in the colored version above.